Former US Army officer Jacob Muñez and Davaoena masscom student Joy Wu were crowned Mr and Miss Chinatown 2017. The pageant was held at Solaire Hotel and Casino. The Mr. and Miss Chinatown pageant aims to strengthen Filipino and Chinese relations. The event is also a fusion of modern and traditional customs that highlight Chinoy heritage. Ms Chinatown 2017 Joy Wu, 21 is currently pursuing a degree in Mass Communication at the Ateneo de Davao University. Joy will represent the Philippines in the 2018 Miss Chinese International pageant in Hong Kong. Title holders Joy Wu and Jacob Munez were also the proud recipients of the ‘Darling of the Press’ award during the Mr and Miss Chinatown 2017 press presentation. Other pageant winners are first runners-up Martin Sy and Angela Elpa and second runners-up, Allen Wu and Kency Ongkeko. The winners will receive P200,000; P100,000; and P50,000 worth of cash and prizes. 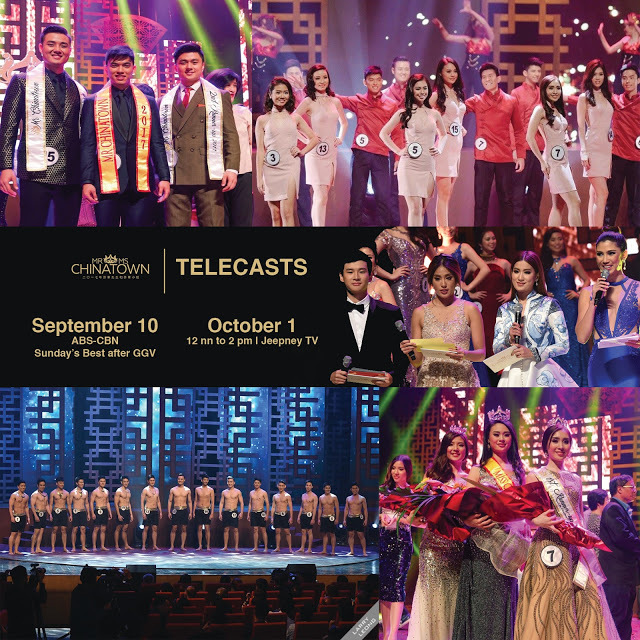 Directed by Paolo Valenciano “2017 Mr & Ms Chinatown” will be aired on Sunday, Sept. 10, on ABS-CBN’s Sunday’s Best.